Among Dungeons & Dragons fans, Poul Anderson’s Three Hearts and Three Lions gets the most attention, as it contains Gary Gygax’s models for the paladin and the troll. But as a read, Three Hearts and Three Lions pales next to Anderson’s finest fantasy, The Broken Sword. 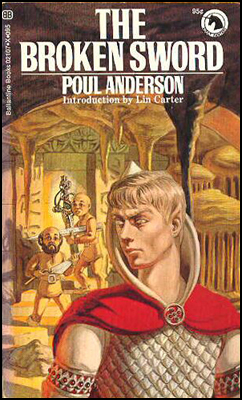 With The Broken Sword, Poul Anderson writes a book inspired by the same Norse sagas that fired Tolkien’s imagination. But while a nostalgia for an idyllic past colors Tolkien’s work, The Broken Sword hews closer to the bleak reality of history. The heroes of The Broken Sword see murderous viking raids as an ordinary summer, and enslaving thralls as the prerogative of the strong. Here, the elves and other “good” faerie folk seem as dangerous and amoral as the trolls and goblins—all well suited for frightening a skald’s listeners around the fire. If you think the Feywild lacks menace and danger, then the The Broken Sword becomes required reading. Both gods and faerie bring doom to the mortal men unlucky enough to cross paths. The story turns on a witch’s entirely-justified quest for revenge. No fairy tale plot of poison apples or spinning wheels, her plan relies on cunning and dark bargains. The story adds a changeling, an apocalyptic war between elves and trolls, forbidden love, and a demon-haunted runesword. The Broken Sword jams more passion and emotion in a slim volume than modern fantasies work into a fat trilogy. The tale’s villains earn nearly as much sympathy as the heroes. As the story hurtles forward, both heroes and villains call on ever more dangerous means to achieve their ends, knowing they draw closer to doom, but unwilling or unable to stop. Originally published in 1954, The Broken Sword quickly dropped out of print until 1971, when the success of the Lord of the Rings opened the door for paperback reprints of other fantasies. For the 1971 printing, Anderson took the unusual step of revising the book. He drew on 16 years of additional writing experience to make it “more readable.” You can find an excellent account of the differences between the two editions in Broken In Two: Poul Anderson’s two versions of The Broken Sword. The Broken Sword ranks with Guy Gavriel Kay’s Tigana as my two, favorite single-volume fantasy books. This entry was posted in Inspiration and tagged Elric, Faerie, Michael Moorcock, Poul Anderson, The Broken Sword, Tolkien. Bookmark the permalink.